Prime Minister Shinzo Abe, who is en route to Moscow for summit talks with Russian President Vladimir Putin, is leaning toward accepting a postwar peace treaty with Russia if Moscow hands over two of the four islands contested by the two countries, Japanese government sources said Sunday. Abe, who is hoping to reach a broad agreement on the peace treaty issue later this year, said he wanted to take as much as time as possible to hold “candid” talks with Putin, as he left for Moscow on Monday afternoon. 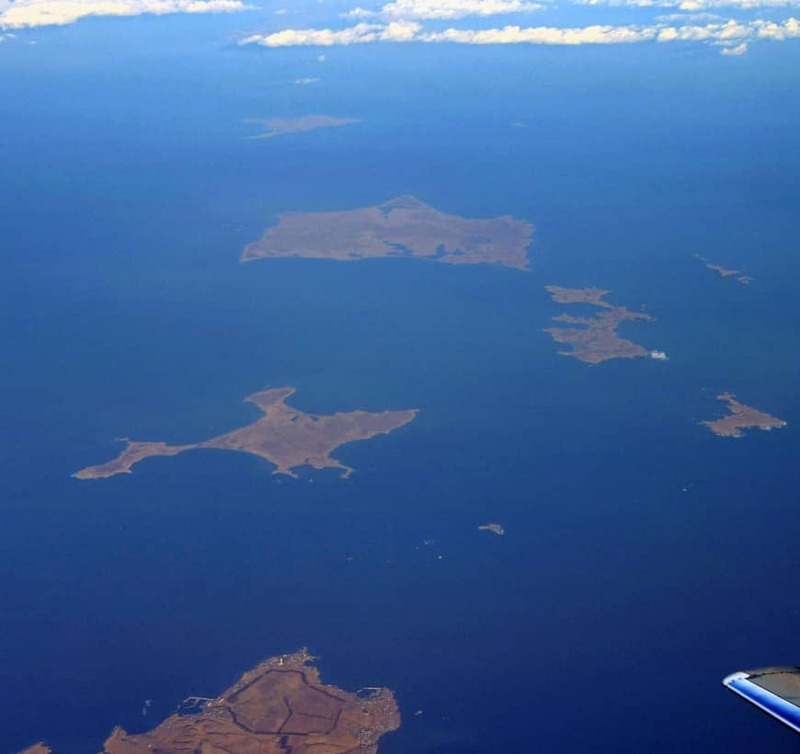 The new approach now under consideration to settle the territorial dispute marks a departure from Tokyo’s long-held position of aiming for the return of all of the islands off Hokkaido, which the Soviet Union seized after Japan’s surrender in World War II in 1945. 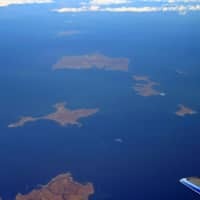 The territorial dispute over the Russian-held islands off Hokkaido, called the Northern Territories in Japan and the Southern Kurils in Russia, has kept the two countries from signing a postwar peace deal. “It is not realistic,” a senior government official said, referring to whether it is possible to persuade Russia to also hand over Etorofu and Kunashiri, two of the islands which account for 93 percent of the total area of the four in dispute. Abe, who is looking to leave a diplomatic legacy by settling the long-running dispute, will hold his 25th summit with Putin in Moscow on Tuesday. During a meeting in Singapore in November, Abe and Putin agreed to step up talks based on a 1956 joint declaration that states Shikotan and the Habomai islet group would be transferred to Japan by the Soviet Union following the conclusion of a postwar peace treaty. The agreement between Abe and Putin drew speculation at the time that Abe would focus on the handover of Shikotan and the Habomai islet group before turning his focus to the two larger islands. But a senior official close to Abe said, “There is no way that Mr. Putin would approve this” and suggested that the prime minister is becoming increasingly pessimistic about securing the transfer of the two smaller islands first and the rest later. Abe seems to have accepted that continuing to call for the return of Etorofu and Kunashiri could stagnate the ongoing talks, and perhaps even dampen the prospect of the two smaller islands being transferred to Japan. But he could face a backlash from his support base, with many Japanese deeming the new approach as giving up on Etorofu and Kunashiri — both of which the government has claimed to be an inherent part of Japan’s territory. After assessing public opinion, Abe is expected to make a final judgment as to whether Japan should strike a deal with Russia on the basis of securing the handover of the two smaller islands. Abe is seeking a broad agreement with Russia in June when Putin is expected to visit Japan for a summit of the Group of 20 advanced and emerging economies. During the previous meeting, Abe touched on the 1956 declaration and told Putin that the contents of the document are Japan’s “nonnegotiable line,” according to the sources. Putin is said to have shown understanding toward the proposal. But it is unclear whether the negotiations will go smoothly; Putin has also suggested that even if the two islands are handed over to Japan, that does not necessarily mean their sovereignty will also be transferred. The president has claimed the joint declaration does not specify whose sovereignty the two islands would fall under. In mid-January, Russian Foreign Minister Sergey Lavrov told reporters it would be difficult to make progress in the peace treaty talks without Japan’s acceptance of the outcome of World War II, including Russia’s sovereignty over the islands. Lavrov’s remarks following a meeting in Moscow with his Japanese counterpart Taro Kono signaled that Abe may face significant challenges at his 25th summit. Security could also be a key topic in the talks as Moscow has been concerned that U.S. troops could be deployed on the islands if they were handed over to Tokyo. Tokyo and Moscow have promoted confidence-building steps centering on economic cooperation in recent years, making little progress on a peace treaty. Following the summit, Abe will travel to Switzerland to attend the World Economic Forum in Davos.